We are instrumental in offering a wide range of Reverse Osmosis Plants to clients located throughout the country. These plants efficiently treat unfit ground water and turn it into quality water that is fit for drinking and also for industrial use. These are widely used for drinking water treatment as well as industrial water treatment. Our plants are economical in operation and easy to install, maintain and operate. We also give complete after sale service to all our customers all over world. 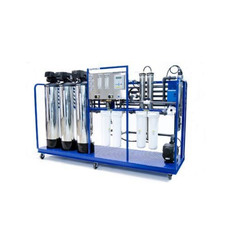 Owing to our expert team of technicians, we are market leading manufacturer, supplier and exporter of Reverse Osmosis Plants . These systems are widely used nationwide for purifying water. Offered system is created after a through research of market and the need of pure water around globe. These RO systems are manufactured using premium quality raw material sourced from reliable suppliers and then fabricated by our skilled professionals using modern tools and advanced technology. This system is highly reliable as we make these systems pass through various quality check process ensuring qualitative product at customer's end. RO Water Plant offered by Kanti Industries permeates high quality water from seawater, municipal and well water. The production rate is based on feed water at 25°C, with turbidity of less than 1 NTU, silt density index (SDI) of less than 5. The Seawater RO Systems are designed for a total dissolved solid of 36,000. The reverse osmosis process uses semi permeable spiral wound membranes to separate and remove dissolved solids, organic, pyrogens, sub micron colloidal matter and bacteria from water. Feed water is delivered under a pressure of approximately 16 kg/cm2 through reverse osmosis membranes. Water Permeates the minute pores of the membrane and is delivered as purified water. Impurities in the water are concentrated in the reject stream and flushed to drain. Reverse osmosis is capable of removing 90-99% of total dissolved solid (TDS), 99% of organic, including pyrogens, and 99% of all bacteria in the feed water.